It’s here… the holiday season has started. I can feel it. Now that our granddaughter is 3 years old she realized that Santa will be coming soon. There is something magical at this time of year when you have young children around. I think that we forget about the magic of Christmas when children are not involved. My granddaughter, Aubrey was at our house when I made these candies; she helped me with the decorating. She loves helping in the kitchen when she is visiting. It is as much fun for me as it is for her. 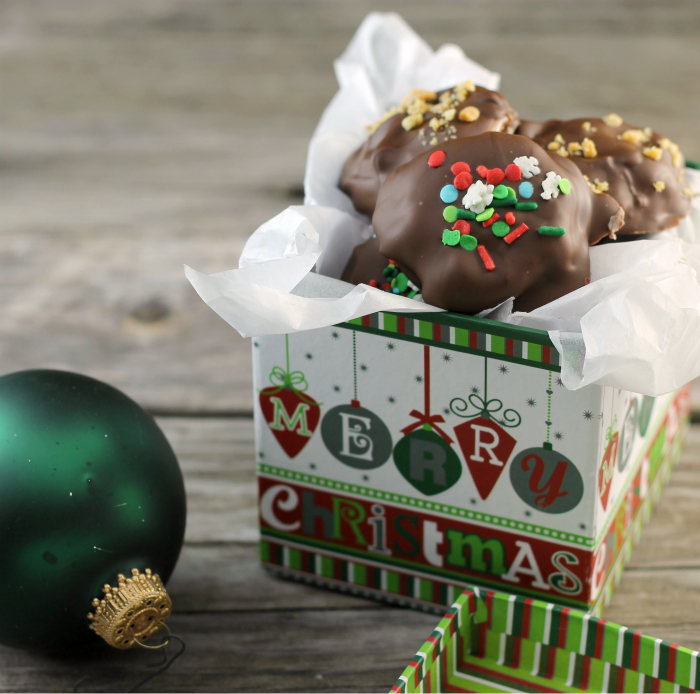 I make a few different candies each year at Christmas time, it is a tradition that I learned from mom. 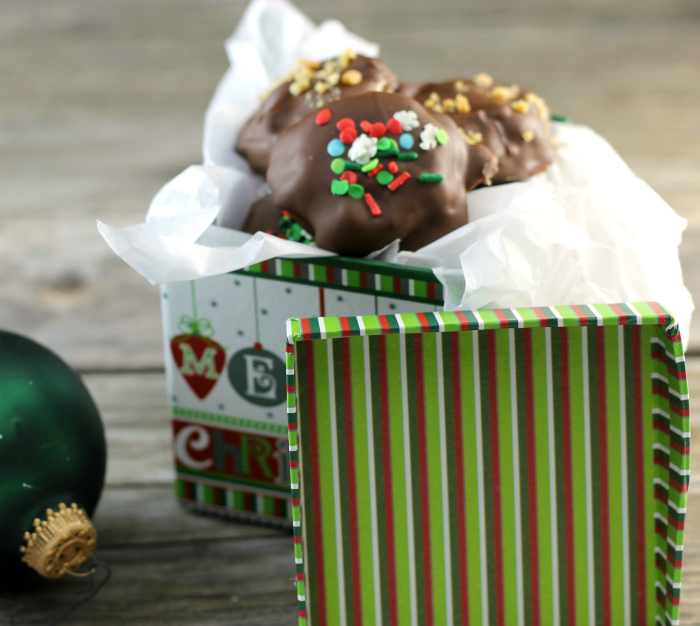 Christmas time was always a time when my mom made her special candies and cookies. This candy is something new this year. I love the sweet and salty combination in this candy. Really chocolate, caramel, and peanuts are always a good thing, but when you throw in pretzels, it really takes it to a new level. They really aren’t too hard to make, a little time consuming, but anything this yummy is worth it. 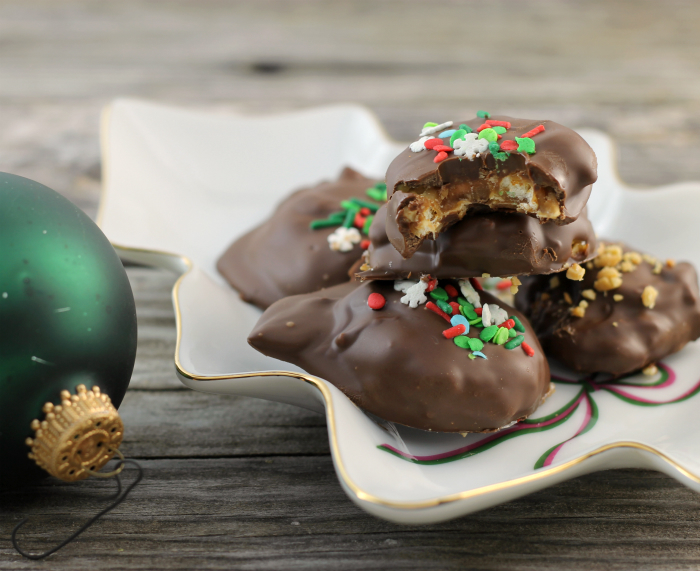 I used caramels, the individually wrapped ones and melted them with a bit of heavy cream. Once the caramels were melted I coated the pretzel with it and then rolled them in ground peanuts. After the pretzels were coated they were set in the refrigerator to set up. Once the caramel was set up they are dipped in chocolate. Decorating is optional. Using a mini food processor process peanuts until they are finely ground. To a small sauce pan add the caramels and cream. Over medium heat melt the caramels stirring continuously. With a fork or a toothpick dip the pretzels in the hot caramel until they are well coated. Once they are coated with the caramel roll them in the ground peanuts until the are coated. Place them on a butter cookie sheet and put them in the refrigerator until the caramel is firm. Melt the chocolate chips along with the shortening in the microwave, running the microwave for about 20 seconds at a time and stirring after each 20 seconds until the chocolate is melted. Dip the pretzels in the chocolate until the pretzels are completely cover. Place the pretzels back into the refrigerator for about 30 minutes or until chocolate is hardened. 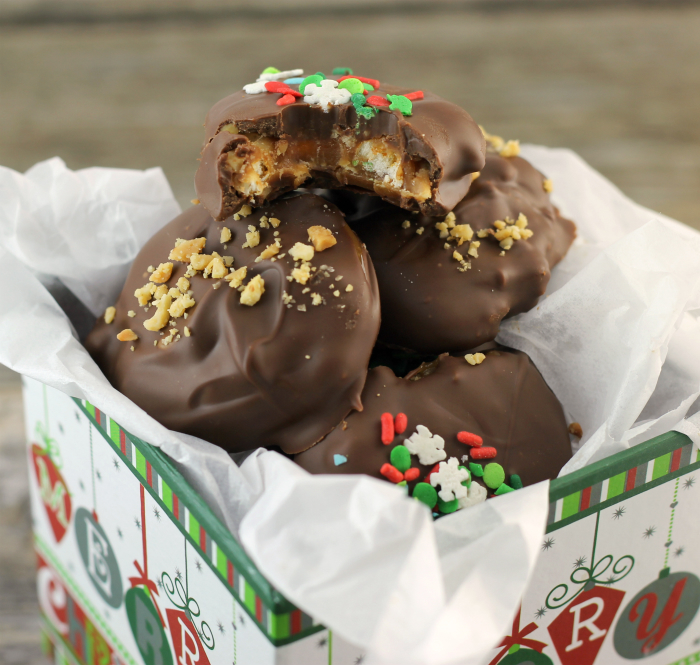 Peanut butter, chocolate and caramel….a heavenly combination, Dawn. The combo sounds delicious Dawn! I bet these are hard to stop eating once you start! They wouldn’t last until Christmas over here. Your granddaughter sounds sweet! She’s taking after her Grandma already. Hi Dawn, so sweet that your granddaughter helps you in the kitchen. Looks like you girls did a great job. They look delicious! I love, love, love, that second to last photo, Dawn. Well done, you. Hello Dawn! Thanks so much for stopping by my ‘place’ recently and leaving a comment. I’m glad I stopped to say hello because this post really caught my eye. These little gems look fabulous! Thanks, Susan. Dawn, I can’t wait to try to make these! If they turn out for me, they will make a beautiful addition to my neighborhood cookie plates. Thanks for the recipe! I hope you are doing well and that your holidays are full of happiness and all of the people you love!